LOS ANGELES — It was always about adversity. Kevin Garnett’s knee. Glen Davis’s fight. From the start of the season, the troubles seemed to come in a constant downpour. But it was always about how the Celtics would handle them. The trade rumors. The inner turmoil. The frustration that simmered as they absorbed embarrassing regular-season losses. How would they respond to it all? They would have been fooling themselves if they believed that Kendrick Perkins’s knee injury would be their last bit of turbulence. Game 7 against the Lakers would be a struggle, mentally and physically, and they knew it. But they also knew what it would have meant to win. They knew it when they were up by 13 points in the third quarter. They knew it in the middle of the fourth quarter when that lead had evaporated. After a largely dormant first half, Kobe Bryant woke up. He pulled up from 17 feet, getting possibly his cleanest look at the basket all night, and drilled it as if it were on a zip line. With the Celtics down, 68-64, with 5:22 left, the Staples Center suddenly felt more like a pressure cooker with every possession. Adversity followed the Celtics all season. When it showed up last night, they fought. They were down, 76-70, when Rasheed Wallace knocked down a 3-pointer to make it a one-possession game. They were down, 79-73, when Allen drilled another. 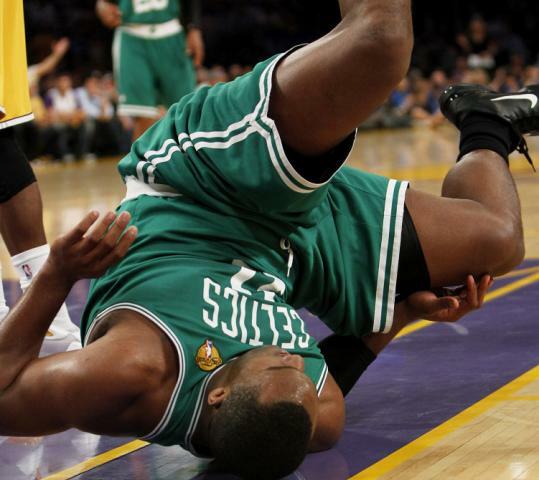 They were down, 81-76, with 16 seconds left when Rajon Rondo drained a three from in front of the Lakers’ bench. But in the end, the Celtics couldn’t overcome it all. The Lakers won their 16th NBA championship, hanging on for the victory, and as the Celtics swallowed the loss, their locker room was largely silent. At that moment, the thoughts were not just about what had happened last night, but about what had happened all season. “There was a lot of crying in our locker room, a lot of people who care,’’ said Celtics coach Doc Rivers. “I don’t think there was a dry eye. A lot of hugs, a lot of people feeling awful. That’s a good thing. You know, that means everybody cared. Meanwhile, confetti falling until long after the game was over, the Lakers celebrated. They have now won just one fewer championship than the Celtics. Coach Phil Jackson now has 11 titles, two more than Celtics patriarch Red Auerbach. Bryant (23 points, 15 rebounds) now has five rings, as many as Magic Johnson, his legacy as one of the greatest Lakers ever further cemented. Garnett’s 17 points weren’t enough. 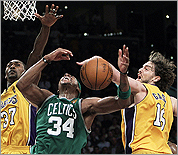 Neither were Paul Pierce’s 18 points and 10 rebounds. The Celtics controlled the Lakers for three quarters, diving for every loose ball, blanketing Bryant with double and triple teams, fighting for rebounds with their best rebounder watching from the bench. But ultimately, fatigue set in. Pierce, Allen and Rondo each played at least 45 minutes. Filling in for Perkins, who tore his MCL and PCL in Game 6, Wallace played 36, cramping up at one point on the sideline, having spent more time on the floor than he had all postseason. The Lakers shot 32.5 percent, and Bryant missed 18 of his 24 shots. But the game was decided the same way as the six before it. The team that won the rebounding battle (Lakers, 53-40) won the championship. It was hard not to think about what impact a healthy Perkins would have had on the outcome. But at the same time, the Celtics had dealt with injuries all season. It was more difficult knowing they couldn’t figure out a way to fight through it. Julian Benbow can be reached at jbenbow@globe.com.